I've been doing lots of sorting and organizing lately, and the other night I spent some time going through some of my cooking notebooks. I started Sara's Cookbook #1 when I was 18 years old. I copied recipes from my Mom, my friends Moms, even my boyfriends Mom who was a bad cook. I pasted in recipes from Gourmet, Bon Appetit and Vegetarian Times. And then I started to add my own creations and ideas. I'm having so much fun looking through the early books. I can see the beginnings of my vegetarian time; when my roommate and I went through our bread making phase; which cookbooks and authors I was obsessed with at the time. And then when I had regular access to the internet? Holy Cow. I would spend entire evenings searching for recipes on the internet, and then copy them into my books. I am such a party animal! 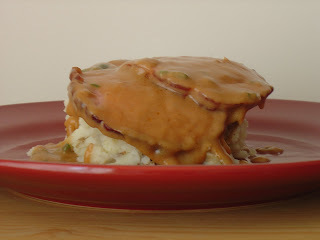 The original recipe for this dish comes out of Cookbook #3 and looks like I cut it out of Gourmet magazine. The magazine version had veggies in it, but I was really just interested in the pineapple and basil. The cooking fairies (??) 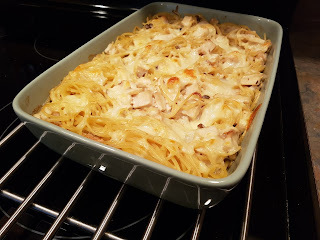 must have been smiling down on me when I came across this recipe again the other day. 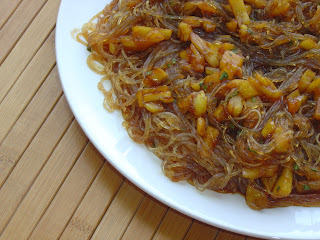 There were cellophane noodles in the pantry, a fresh pineapple on the counter, and basil outside in the garden. I am crazy about this dish. The pineapple and basil are amazing together, and this is the perfect recipe to use up some of the cellophane noodles that seem to multiply in my cupboard. And luckily for me Ruth considers any sort of noodle fair game for Presto Pasta Nights! Place the noodles in a large bowl and cover with boiling water. Let sit at least 10 minutes, or longer, until the noodles are soft. Drain well and set aside. Heat a skillet over medium high heat. Stir the cornstarch into the pineapple juice and pour into the pan. Add the soy sauce and simmer until the sauces start to thicken, just a minute or two. Add the pineapple and cook until the pineapple is hot. Add the noodles and toss to coat. Stir in the basil, and remove from the stove. Friends, I'm not going to lie to you. This months Daring Baker recipe was a toughie. Veron and Patricia chose to challenge us this month with a most decadent looking Milk Chocolate and Caramel Tart by Eric Kayser. 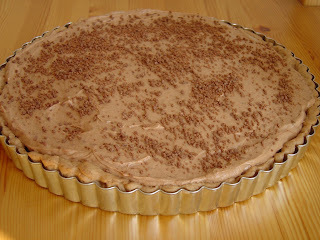 The 3 components of the tart are a chocolate shortbread pastry, a caramel filling, and a milk chocolate mousse. I was down with the mousse, interested in the pastry, but caramel?? AGAIN? If a person can have a food nemesis, caramel is mine. But if I have learned nothing else from the daring baker challenges I have taken part in, I have learned that most of the time I am a better cook than I give myself credit for. Oh how foolish I am! I began with the pastry. The recipe called for the dough to be made in the food processor. Since I don't really have that much faith in how strong my fp is, I used my stand mixer. I also cut the recipe for the dough in half, as the full recipe makes enough dough for 3 tarts. The dough is pretty straightforward: flour, sugar, butter, cinnamon, baking powder, cocoa powder, and ground hazelnuts, which I eliminated. I spent ages looking for my cinnamon in our spice cupboard and finally found the empty container. Oh yeah, I ran out of cinnamon about 3 months ago and haven't bought any more. Oops. I rummaged around to see what I could substitute and decided to use Mace. The dough came together fast, and I preheated my oven. I got out my new tart pan and checked the recipe to see how much dough I needed for one tart. "Blah, blah....Form a ball with the dough, cover in plastic wrap, and chill overnight." Wait, what????? Overnight? I had no time for overnight! Way to read the recipe, Sara. So I did the next best thing and chucked the dough in the freezer for 2 hours. And kept my fingers crossed. It seemed ok when the freezer time was up, so I weighed out the correct amount and smooshed it into my tart pan, and blind baked (cover the dough with parchment paper and dried lentils or beans) the base. Next up I melted the chocolate for the mousse so it would not be too warm when mixed into the whipped cream. And then I turned my attention to the caramel. I tried. I tried SO HARD. 3 TIMES I melted the sugar slowly over low heat. 3 times disaster struck. 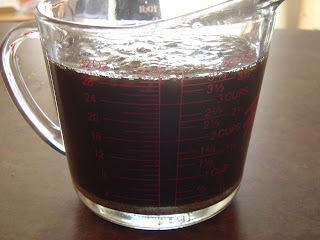 The first time the sugar got wayyyy too dark before it was even melted. Ok, my heat might have been too high. The second time it was so close to being completely liquid and I removed the pan from the heat to swirl it around to melt the last little bits. When all the sugar was melted I added the cream and...well I guess I had the caramel off the heat for too long because the second the (not cold) cream hit the caramel, it seized right back into a solid mass, floating in cream. By the time I was all cleaned up and ready to try again I was at my wits end and also almost out of sugar. If it didn't work this time, I was not trying again. It worked...almost. There were some hard bits of sugar that just would not melt. So after adding the cream and butter, I strained out the lumps and kept going. After a bit of cooling, eggs and flour were whisked together and then added to the caramel. I had lovely little bits of floury bumps floating in my caramel, but I didn't care. 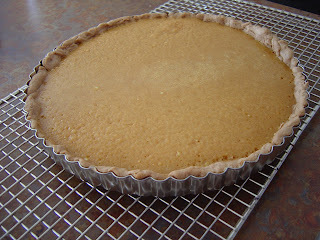 I poured the caramel into the tart pan and...there wasn't enough room in the pan for all the filling. Why??? At this point I was ready to admit defeat. And then I read the instructions again. "Use a 9" square pan or a 10" round pan." I was using a 9" round pan. I threw the pan in the oven and hoped for the best. After leaving the tart in the oven for double the baking time, it seemed to be barely softly set. I set it to cool, re-melted the chocolate for the topping, and sat down in the living room with a drink. After sufficient cooling time, I whipped the cream, folded in the melted chocolate and spread the mousse on top of the tart. Since there was no way in hell I was going to make more caramel to decorate the top of the tart, I chopped up leftover chocolate in my mini chopper and tossed the bits on top. It was very pretty. It tasted fine. But I just couldn't get over the caramel issues and my non-ability to read. But the 10 other people who ate it all loved it. I thought the Mace in the crust was nice, although two people commented on the "different spice" in the dough, and one taster asked if there was pumpkin in the tart. I got a marriage proposal (don't worry Scott, I turned her down) and was told by one lovely girl that I should quit my job and work in a bakery. 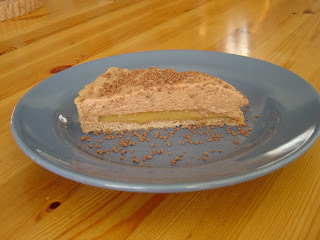 All participating Daring Bakers are also posting about their tart experiences today. You can go here for links to everyone's blogs. If you are insane and want to try this recipe yourself, go here. A couple of months ago my boss ( see flapper pie, cheesecake cookies, and let's not forget the birthday cake incident) asked me to do him a favor. Sure, I said. He whipped out some photocopied pages from cookbooks and a handwritten letter and asked me if I would make him an Irish Spiced Beef. 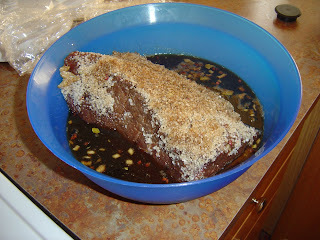 "It's roast beef that you rub with sugar and spices and then boil. It's delicious!" He'd had it when he was in his 20's, he told me, when he was dating a girl whose Grandmother would make it on a monthly basis. When he and the girl broke up, no more spiced beef. 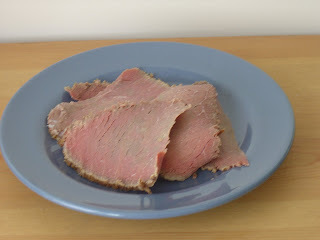 Another girlfriend had found him some recipes for spiced beef a few years ago and while cleaning up some old boxes at his house he came across them. "I remember how wonderful the spiced beef was. Please, will you make it for me? I'll pay for all the ingredients. And share the roast with you too." We sat down and looked at all the recipes and notes he had. He pointed out things he thought I should do from certain recipes, and things he didn't think I should follow in others. We talked about ingredients - what he remembered was in it and pointed out spices he didn't want used. I promised to take everything home and see what I could cobble together. And I forgot all about it. But then when I was cleaning some papers off my desk at home, I found all his notes and decided to give it a try. Why not? I wouldn't be out of pocket for anything, and it would be fun to blog about. Which is the yardstick for my life. So I sat down with his papers and came up with a recipe for what I hoped would taste good in the end. Day 1 - I went shopping and got all my ingredients. Since it wasn't my money I was spending I went to the butchers and got a beautiful 6 lb organic beef roast. That night after dinner the roast was untied and washed, then dried and placed in a large bowl. 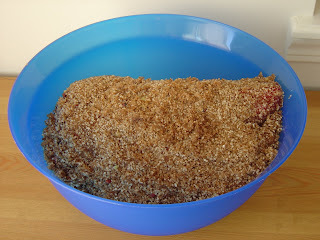 I mixed together all my rub ingredients - 1 POUND of salt; 1 oz sodium nitrate; 1/2 tsp each of ground cloves, ground allspice, and whole peppercorns; 1/4 tsp each of ground ginger and ground mace; 3 dried bay leaves, crumbled; 1/4 cup diced onions; and 1 1/2 cups brown sugar - and rubbed the mixture all over the beef. The house smelled like Christmas. The bowl was covered very very well with plastic wrap and put in the fridge, where it would live for the next 15 days. Day 2 - I am going to turn and rub the roast every day. I pull it out of the fridge, remove the plastic wrap and am horrified by what I see. The roast is visibly smaller and is surrounded by.....juices. I knew that the salt would be pulling out the liquid from the meat, but I didn't expect quite so much. Also, the texture of the roast has changed in just one day; it's hard. Even Scott is a little grossed out by it. We don't know what to do; do we leave the liquid in there, or should we drain it off? I carefully read all the recipes and notes again. None of them say anything about liquid. We quickly rub and turn the roast and put it back in the fridge. My boss has gone on a holiday and I don't really think I want to call him to ask his opinion about it. What am I going to do? I think about it as I wash my hands for 20 minutes. Day 3 - I Google "Irish Spiced Beef" and am put at ease right away. The first 3 results all mention liquid and say to not discard it. I still think it's pretty gross though. We take the bowl out of the fridge, turn the beef, and scoop up the spices from the bottom of the bowl to rub all over the meat. Day 15 - time to finish up! I take the beef out of the fridge. Mmmm. So.....appetizing? The beef is washed and dried. For fun we measure how much liquid has ... come out ... of the beef. The beef is very poorly tied by me, then placed in a large pot. An onion cut in half, 2 carrots, and a celery stick are added. Pour in water to cover, and bring the pot to a simmer. Simmer very gently, covered, for 2 1/2 hours. 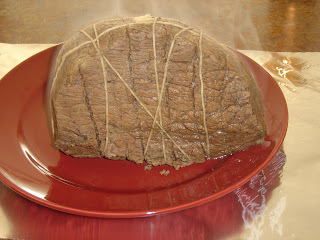 Remove the beef, wrap well in aluminum foil and let sit at room temperature until cool. Refrigerate overnight. Unwrap and thinly slice the meat. 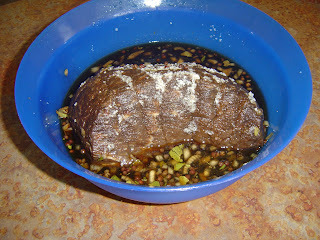 Traditionally Irish Spiced Beef is served cold. This was very salty. I mean, how could it not be, with a pound of salt! But still, it was very borderline edible for me. Scott liked it, and my boss said that it was very similar to what he remembered, which was good. The roast was very tender too, but I wouldn't make this again. Too much meat, too much time, too much salt. It was interesting to try though, and I am glad I did, if only to share it here with you. Have you ever had Spiced Beef? Is it/was it a tradition in your family? Yesterday I wrote about my Saturday trip to the farmers market and about Operation: Too Many Tomatos. The tomato level is going down slowly. When you have a large box of tomatos taking up counter space in your kitchen, using them one at a time in salads or sandwiches doesn't make much of a dent. So I thought I'd make up a pasta sauce for Presto Pasta Night this week, not a cooked sauce though, a raw one. If we were still having our hot weather (see, I told you I'd miss it!) this would be a perfect dinner for getting in and out of the kitchen fast. With some fresh pasta that only needs a few minutes to cook you could have this meal done in 10 minutes, I bet. You could also use this as a topping for brushetta, in a salad, or on a piece of grilled chicken or beef. Heck, you could whiz it a bit longer in the food processor and call it gazpacho! This was delicious, though a little wet. Next time I find myself with 10,000 pounds of tomatos and making sauce I think I might de-seed some or all of the tomatos. Or just drain off some of the liquid before tossing with the pasta (which is what we actually did). and process until finely chopped, but not a paste. Scrape down the sides often. and pulse, again scraping down the sides, until the tomatos are chopped into small pieces. Unless you really do want to make gazpacho, watch carefully. Pour sauce into a bowl, taste and season with salt and pepper if necessary. Cover and let sit for at least one hour before using. I cooked up some fusilli noodles, drained some of the liquid from the sauce, and tossed the noodles, sauce and some goat cheese together. Yum! Have you joined Ruth for Presto Pasta Nights yet? Ruth does the round-up every Friday - email her your post at ruth at 4everykitchen dot com. 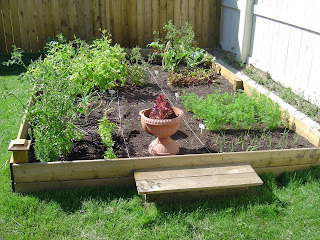 Garden Update and a trip to the market. Both new and old onions are doing well. The carrots are gorgeous and delicious. I pulled up the spinach after Tanna, Mary and my Mom told me it was beyond saving. I replanted more spinach a few weeks ago, but nothing is happening in there. We've got tons of green tomatos, and have dug up enough potatos for 3 meals! Unfortunately the zucchinis are not doing well. I don't think we'll get anything off of either plant. 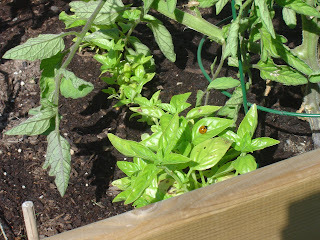 Look who's visiting my basil! Awww, so cute. 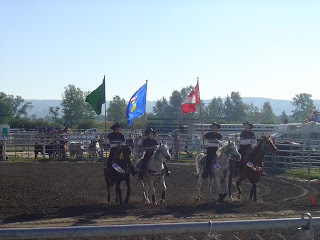 I went to Millarville on Saturday, and they were having their 100th Priddis and Millarville Fair. I saw some animals, old farm machinery, and the musical ride. 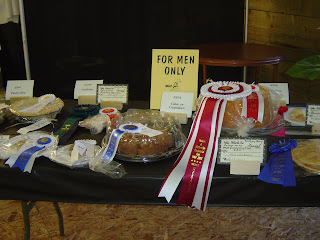 There were all sorts of competitions for animals, agriculture, arts, and food. 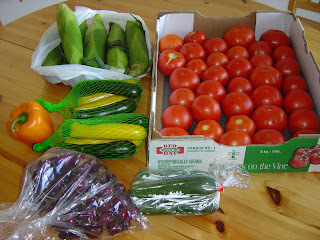 A literal ton of tomatos, cucumbers, cherries, zucchinis, pepper and Taber corn. I lurched back to my car and put all my goodies on the ground to get my keys out of my bag. An elderly couple was walking by into the market, and the gentleman said "Oh my, that is too many tomatos!". Now that I have them home, I am almost in agreement. So Scott and I have started Operation:Too Many Tomatos. You can look forward to many, many tomato related posts here in the future. If anyone wants to give me suggestions to use them up, email me!!! The fab Paige at Chef Girl has the round up done for Weekend Cookbook Challenge 19 - Dinner and a DVD. 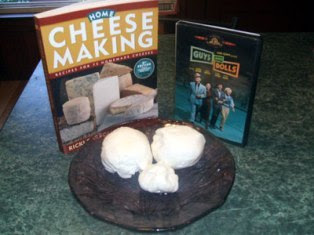 Homemade Mozzarella Cheese from Mike at Mel's Diner. Next months Challenge is #20 and the theme is Show and Tell. Pick a cookbook from your collection that you think we should know about. Your favorite, your funniest, your strangest. Whatever. It's your choice. Cook a recipe, blog about it, and send me a link to your post! The deadline to get your posts to me is September 16. My email is iliketocook at shaw dot ca. As always, if anyone would like to host WCC for a month, or if you have an idea for a challenge, let me know! Now don't worry. I haven't turned into a writer slipping into insanity in a secluded hotel in the middle of winter. I'm simply a girl with some rum and rapidly-going-downhill-raspberries. Rather than toss them because they are getting a bit too mushy, I turned them into a versatile sauce. Go me! Bring the water and sugar to a boil over medium high heat. Cook, stirring until the sugar has dissolved. Reduce the heat and add the raspberries. Gently simmer the sauce until the raspberries have broken down fully, 10-15 minutes. Add the rum and simmer for another 5 minutes. Remove from heat and let cool 10 minutes. Now at this point you could let the sauce cool and use it as is. I prefer to strain it. Place a fine mesh strainer over a bowl and pour in the sauce. Use a wooden spoon or ladle to push through as much of the fruit as possible while leaving the seeds behind. Let cool and refrigerate until ready to use. If I'd had my wits about me, I would have saved some for drizzling over a piece of angel food cake, or maybe some sliced pineapple. Guess I'll have to get some more raspberries. And more rum. Raspberries are full of fibre, high in Vitamin C and Vitamin K, and high in Antioxidants, making this perfect for Antioxidant Rich Food Tuesday over at Sweetnicks. All that goodness and good for you! What's not to love? Do you know what a negociant is? How about Blaufrankisch? Have you ever used the term Flabby - not as a description of your thighs, but rather your glass of wine? Me neither, at least not until I started reading Educating Peter: How I Taught A Famous Movie Critic the Difference Between Cabernet and Merlot by Lettie Teague. I was very intrigued when I was offered this book as I am pretty much as far from an informed wine drinker as you can get. Oh sure, I've been to Napa Valley; done dozens of winery tours and tastings in Canada's beautiful Okanagan area; even sat in on some wine classes at a downtown restaurant, but I've never really got wine. While everyone else was swirling and sipping, muttering things like "Fatty", "Chewy" and "Citrus and Pine aromas", I'm in the corner thinking "It tastes like WINE. End of story." Obviously this book was meant to find me. The first thing that struck me is that this is a fun, non-intimidating book. It's the story of how the executive editor of Food and Wine magazine taught a movie critic the ways of wine. All the basics to get him, and the reader started are here: terminology, how to hold a glass, how to smell and taste the wine. I found the chapter on bottle color, shape and size very interesting. Who knew how much information you could learn from just the vessel? Once the basics of wine are covered we move into wines and their regions. "Old World" (France, Italy, Spain and more) and "New World" (New Zealand, South Africa, California et al) are both covered - the areas, grapes and wine. Very easy to read and very informative. 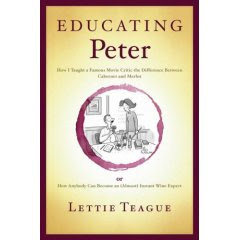 My favorite part of the book is when Peter leaves the "classroom" and heads out into the world. Armed with the knowledge the author has given him, Peter navigates through restaurants, wine shops, and meets wine collectors and sommeliers. It was interesting to see how much he had learned and how much his appreciation and openness to different wines expanded. So what did this book do for me? Well, I certainly did not end up in the same league as Peter, but I definitely picked up some new information and had fun while doing it. For anyone interested in expanding on their beginners knowledge of wine, this book is truly an enjoyable read. This weeks pasta for Ruth's (of Once Upon A Feast) Presto Pasta Night came about from my new favorite past time: avoiding grocery shopping and seeing what I can find in the fridge, freezer and pantry. Just like my Orzo and Ham Pasta Salad and my Soba Noodle Salad for recent PPN's, I turned to our overstocked shelves in the kitchen to see what I could find. I'm finally making a dent in our pasta "collection". I grabbed the last bag of fusilli and peered around some more in the pantry. Not seeing anything that was grabbing me I checked out the fridge to see what I could find for a sauce. In the door of the fridge was a half full bottle of pesto. As neither Scott or I are fans of traditional pesto - both of us don't like pine nuts - I don't know where this came from. Isn't that odd? I gave it a taste and it was pretty darn good; the pine nuts weren't very prominent in the flavor. IDEA! Cold pasta salad with pesto. I cooked the noodles, drained and rinsed them in cold water. The pesto got thinned just a tad with some water, then tossed with the pasta. After seasoning it with salt and pepper I gave it a taste. Good, but it needed something. Something like tomatos! I chopped up a couple of tomatos, threw them in and it was perfect. After having a couple more bites I poured it onto a dish to take some pictures, then packed it up in the fridge for later; I figured it could feed both of us for lunch for a couple of days. Later that day Scott, that wicked, wicked man ATE. IT. ALL. when I wasn't around. Just want to remind you that the deadline for sending in your post for WCC 19 - Dinner and a DVD is coming up. Paige from Chef Girl is the hostess this month. Pick a movie/tv show/documentary/concert/whatever DVD from your collection. Head over to your cookbook collection and find a recipe that somehow connects with your DVD choice. Cook said recipe, and blog about it. Email (paige_elizATyahooDOTca) Paige with a link to your post. I would appreciate it ever so much if you'd include a link to the WCC blog too. The deadline is August 19, and Paige will have the round up done shortly after that. This is a fun one (not that all the others haven't been fun too! ), so get cracking and cooking and join us! PS - here's my entry for WCC 19 - You've Got Red On You Pasta, made for one of my favorite movies, Shaun of the Dead. Julia Child Birthday Event - a day of Julia's food. Lisa at Champaign Taste is holding her second annual Julia Child Birthday Event to celebrate the birth of one of the most beloved cooks in history on August 15. I'm happy to be taking part in this as, like pretty much everyone else in the world, I adore Julia Child. I used to love watching her on PBS and her Mastering The Art Of French Cooking had a prominent place in my Mom's kitchen. I am proud to own that book too, and recently my friend Mary introduced me to Volume Two which I am now desperate to get my hands on. I read the Julia Child memoir My Life in France last year and came away worshiping Julia Child even more. What an incredibly amazing woman. So much life lived, so much accomplished in her 91 years on Earth. And so as a tribute to Julia Child I am taking part in Lisa's event with not just one dish, not one meal, but a full day of food by Julia Child. Cook the bacon until crisp in a large pan. 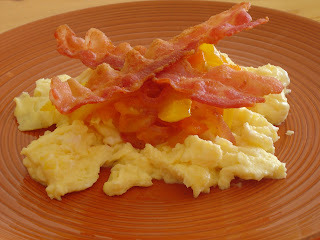 Remove the bacon from the pan and drain on paper towels. Remove all but 2 tb of the bacon fat. Add the onion and peppers and cook over medium heat until soft. Add the tomatos and cook for 4 or 5 more minutes until the tomatos are starting to break down. Season with salt and pepper and keep warm over low heat. In another pan, heat 1 tb of bacon fat. Whisk the eggs in a bowl, then pour into the heated pan. Cook, stirring gently with a spoon, until the eggs are set. To serve, divide the eggs between 2 plates. Top with a generous scoop of peppers and tomatos, and place 2 pieces of bacon on the top of each mound. 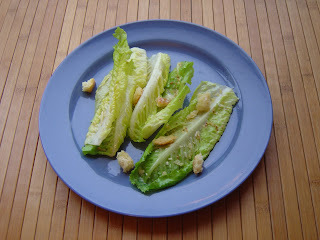 A classic Caesar Salad. At one time when you ordered a Caesar Salad in a restaurant, it was made fresh at your table. You could definitely do that with this recipe. The whole procedure, from leaving the leaves whole, to making your own garlic croutons, to mixing the ingredients in the bowl with the leaves is pretty impressive. The dressing does not include garlic or anchovies, staples of pretty much all Caesar dressings today. It does, however, contain a coddled (barely cooked) egg. Some people think that children, the elderly, pregnant women, or people with immune system issues should not eat raw or undercooked eggs. Just an FYI. Here is the recipe plus instructions on crouton making. Quite the artery clogger. Never one to shy away from butter, cream or booze, Julia throws them all in this dish. Ham slices are sauteed in butter and oil, and removed from the pan. A roux is made with flour, green onions, beef broth and Madeira (we used wine). Some tomato paste, cream and cognac are added and the ham slices are returned to the pan for a final simmer. We served this delicious, rich dish with mashed potatos and fresh corn sauteed with butter. Dessert? Sorry, no. After all the eggs, meat and cream we had neither the room in our stomachs nor in our pants waistline for any more food! So here's to Julia who some 40 years after releasing MTAOFC Vol 1 and 3 years after her passing continues to inspire and instruct any and all that are willing. This months Weekend Cookbook Challenge is the 19th and fellow Canadian Paige of Chef Girl is our hostess! I was very excited when Paige told me what her theme would be - Dinner and a DVD - for two reasons. First, I love finding out about movies/tv shows/documentaries that other people like. I've discovered so many movies and shows from recommendations that normally I never would have watched. And second, because I can share with you one of my favorite movies. 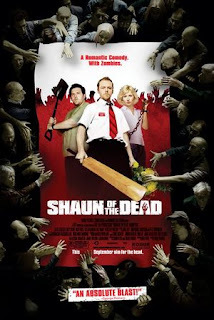 Shaun of the Dead came out in 2004 and was billed as a zom-rom-com (zombie romantic comedy) and is such a funny movie. London is suddenly over-run with hungry zombies and Shaun must save himself and his friends. I honestly couldn't tell you how many times I've seen this movie, but every time I watch it I see something I've missed before, or understand a gag on another level. Run (don't walk) to your neighborhood video store and rent Shaun of the Dead. One of my favorite running jokes in the movie is this: Shaun, an employee in an appliance store, has a red pen in his shirt pocket and the pen bursts. Many people point out "You've got red on you.". Later, after Shaun has had to dispatch some zombies in order to save his mom, she tries to wipe zombie bits off his face, saying "You've got red on you.". Hee! So for WCC 19 in tribute to Shaun of the Dead I've made a pasta with tomato sauce. What better and tasty way to get red on you? I've adapted this recipe from Food and Wine Magazine's "quick from scratch italian cooking", which I picked up a couple of years ago at a Boxing Day sale. For $5! adapted from Cavatelli with Sardinian Meat Sauce from "quick from scratch italian cooking"
Heat a large pan over medium high heat and add the oil. Crumble the sausage into the pan and cooking, pressing down on the sausages to break them up, until brown. Add the onion and garlic and cook until soft. 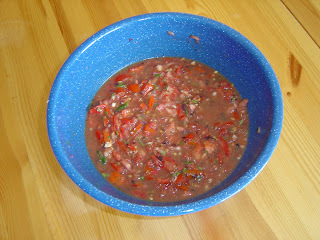 Add the tomatos, mint, water, salt and pepper and simmer, uncovered for 20 minutes, stirring often, until the sauce starts to thicken. Continue to gently simmer the sauce while you cook the pasta in salted boiling water. When the pasta is done, drain and return to the pot. Add in the sauce, basil and cheese, and stir to combine. Scoop into bowls and top with more cheese if desired. You have until August 19 to get your Dinner and a DVD post to Paige. Email her at paige_eliz at yahoo dot ca. I'm back from my little hiatus. It was very nice to step away from the computer for a few days, but when it came right down to it, gosh darn it I missed you guys! Things are still very busy around here, but I hope to be able to catch up on blogs in the next couple of days. Thanks to all of you who emailed me on my break. Y'all are so sweet, and I appreciate your thoughtfulness and friendship. Finally, we've been having the occasional break in the weather and had some cooler days. I know that a few short months from now I'll be freezing instead of boiling and wishing for 36' to come back, but still, it's been sort of nice, especially to be able to get into the kitchen. It's not new information that I am a big fan of zucchini. We've eaten a whole lot of zucchini this summer and hopefully soon we'll be eating them out of our garden. 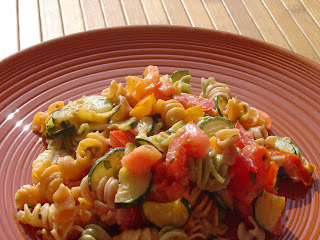 This pasta combines many of my favorite things: zucchini, tomatos and Boursin Cheese. Originally I was going to use Parmesan (which would have been wonderful too), but I changed my mind when I saw the Boursin in the store. This is a fast dish and only takes as long as it takes to cook the pasta. Even if it is hot in the kitchen you won't have to have the stove on for too long. 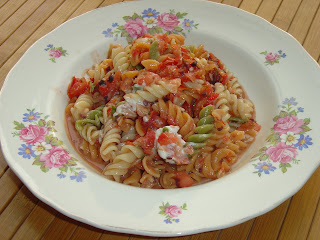 And not only is this dish delicious, it fits the bill perfectly for Once Upon A Feasts weekly event - Presto Pasta Night. Bring a large pot of water to the boil. Salt the water, add the pasta and cook until done. Meanwhile, heat the oil in a large pan and cook the zucchini over medium high heat until soft. Add the garlic and cook until fragrant and the zucchini are just starting to brown. Turn off the burner but leave the pan on the stove. Add the tomatos and basil and mix in. Add in the boursin or cheese of your choice and mix well until the cheese melts and mixes with the tomatos to make a sauce. Taste and season with salt and pepper if needed. When the pasta is done, drain the noodles and pour into the sauce. Mix well and serve. Be sure to visit Ruth's on Friday for the Presto Pasta Nights Roundup! In other news, I have a new post up at Food for Thought on an area of Calgary called International Avenue. We had an awesome time, and I'll be going back there soon to write more about it. Please go and read it! Edited to add: I'm a Rockin' Girl Blogger! Thanks to Lau at are you gonna eat that? for bestowing this honor on me. It's a badge I will wear proudly. I will follow Lau and induct 3 bloggers to the RGB Hall of Fame...Mary, Lis, and Emmy! There's lots going on and I just don't have any energy left for my little blog. I hate to say that, but it's true. I'm drained. I'm tiiiiiiired. So see you in a week. Or two. I'll be looking forward to coming back and catching up on everyone's sites and seeing what you've been up to and telling you what I've been doing too.